Discussion in '3FVape' started by 3FVAPE, Nov 9, 2018. Want to get 3FVape products for free ? Enter the 3FVape 11.11 Giveaway now >>> 4 winners will be chosen randomly. As we all know, Double 11 (Single's Day) is great and important to consumers, and sellers always prepare and promote their products in advance. We are so exciteing to bring you guys a new giveaway for the upcoming annual traditional purchasing festival. If you can not wait for have this item, you can also order the 3FVape products directly on 3FVAPE. The 3FVape 11.11 Giveaway is still underway. There still plenty of time for you to join the Double 11 (Single's Day) giveaway. After 11 days of giveaway activities,the 3FVape 11.11 Giveaway is finally comes to an end. 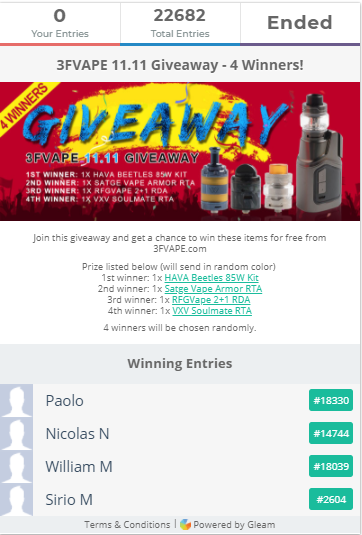 It's a great honor to be here to publish the final result of the 3FVape 11.11 Giveaway.